I hope everyone had a good holiday! For those who celebrate Christmas, I hope Santa was generous. I found a model train car under the tree to help build my fleet. On Boxing Day I set out to do a few hours of railfanning around the Winnipeg area. I took my mother and sister to the airport then went to the CP yards downtown to see what power was around. At the CP Weston shops at 08:50 I saw the following units: 5707, 3117, 9153, 5998, 5940, 8778, 8815, 5988, 3119, 6055, 9760, 8521 and CEFX 117. There was a container train shunting in front of the yard so I couldn't get any decent pictures. I went to the Arlington Street bridge and took some shots from there. CP 1597, 1506 were shunting, as were CP 6065 and 1622. At the fuel stands I saw CP 1562, 1532, 6616, 6609 and several other units. It was a little cold standing on that bridge! I went to the east end of the yard and found CEFX 1041 and CP 9511 shut down at the end of a train at 09:35. CP 8726 was heading up another train there. From there I took a quick look at the Greater Winnipeg Water District (GWWD) railway yard and saw GWWD 201 shut down, with the hulks of CP 8016 and 8018 nearby. On to CN's Symington hump yard, where I found hump set CN 7511, 501, 504, 7528 (two GP38s with two slugs in the middle) and another set working the hump at 10:15. There were two sets of power at the intermodal terminal, one led by CN 2531 and 5360, and the other by weathered CN 5367. I noticed a few odd cars at the foot of the hump. One was GO Transit car 2647, and the other was a Loram unit LMIX 601. There were also a few pressure vessels on flatcars behind the Loram unit. I guess they were on the "do not hump" line. I heard CN train 840 get permission to leave the yard, and I quickly deduced they were heading east toward the Perimeter Highway, so I went down by CN Navin and parked by the Tinkertown amusement park. Great place to take the kids, by the way. As is typical on the Prairies, I saw the train long before it was close enough to take pictures. CN 2531 and 5360 rolled by at 10:39 with a long grain train. From there, I moved to the CN main line along Wilkes Avenue, but that will wait until my next post. UPDATE: Someone asked on the CanPassRail mailing list why GO 2647 was in Winnipeg. The answer: "A friend of mine from the CN has come up w/ the answer, & even more. Go Transit is receiving new Bi Levels from Bombardier in Thunder Bay. They are being taken to Winnipeg Symington Yard. 2647, & 2648 are going out on Train #302 tonight (Symington-MacMillian Yard). 2646 Is Currently at Mac yard, 2645 Arr. Mac Yard Dec 23, 2644 arr. Mac Yard Dec 14, Arr Mimico Dec 17, 2642, 2643 Not on the CN System as of yet. I'm sure in the next few weeks prob more GO Coaches will be arriving at Symington Yard." David Gagnon has posted the 1876 Intercolonial Railway rulebook on his web site. Thanks for posting that! He also shared a lot of information on the ICR itself. Highly recommended. Rules and Regulations of the Railway, including those contained in the Working Time-Table of the District in which he is employed; and he shall keep a copy of the same in his possession, under a penalty of one dollar for not doing so. One dollar would have been a lot in 1876! I had to stop today for a short CP tank train today... CP 3028 and 1128 (both GP9s?) led about 20 black tank cars across highway 90. I didn't get any photos, alas. I do have a short Maritime news item. NB Southern was to plow their Dever Road yard yesterday (Thursday) with the Jordan spreader. Amtrak's Adirondack punches through the snow at a crossing. Click on the photo for a larger version at Railpictures.net. Julien Boily has posted a railfan video from Riviere du Loup, Quebec in June 2006. The first half of the video is a slideshow, and at 03:22 there is video of NBEC 1819, the mainline NBEC freight with 7 (!) locomotives, a brief clip of a CN train, and a VIA train to finish it off. Please consider signing a petition to call upon the New Brunswick and Nova Scotia governments to make improved railway infrastructure a key goal in any Atlantic Gateway agreement. Frank Jolin took a few nice photos of a plow extra on the Montreal, Maine and Atlantic. The train was MMA 2003 pushing plow VB 100. Click on the photo for the large version. Also see the going away shot. I previously reported that CN 148 and 149 don't come to the Maritimes any more. Courtesy of the Atlantic Northeast Rails & Ports newsletter, here are a few more details. What used to happen is that CN 148 would leave Chicago and arrive in Halifax at 08:35, 3 days after departure. Now CN 148 terminates in Montreal. Traffic destined for Halifax is left in Toronto and picked up by CN 120, which is due into Halifax at 06:45 saving 2 hours of time over the old schedule. CN 122 departs Montreal at 03:00 and is scheduled to arrive in Halifax at 06:30 the next day. The main advantage of this plan, beyond the 2 hour time saving, is that a Montreal-Halifax train is more consistent than a Chicago-Halifax train. A train going over a shorter distance is less likely to be late! 120/121 should definitely increase in length and 122/123 will be shorter than the old 148/149. EDIT: for much more detail on the changes, please contact Chalmers (Chop) Hardenbergh, editor of Atlantic Northeast Rails & Ports at 207-846-3549 or editor@atlanticnortheast.com. I was recently asked to provide some information on the Salmon River area, and especially the Little River trestle near the giant Salmon River trestle. I've done some digging and I'll share some random notes with you. The National Transcontinental Railway (NTR) was built in the 1910s for a variety of reasons, none of which seem good from a vantage point of almost one hundred years later. Its construction was authorized as part of an agreement between the federal government and the Grand Trunk Pacific (GTP) on July 29, 1903 where the government would built a railway from Moncton, NB to Winnipeg, MB, while the GTP would build from Winnipeg to Prince Rupert, BC. The GTP would then lease the NTR from the government for 50 years, paying 3% of construction costs per year for 43 years, after getting the first 7 years rent-free. The problem was this. There was already a transcontinental railway - the Canadian Pacific Railway. Some people felt that the CPR needed some competition, so in a bizarre move the government authorized two additional transcontinental railways, the GTP and the Canadian Northern Railway. In the end, both of those failed and eventually became Canadian National Railways. Back to the NTR. As was noted in the "Report of the National Transcontinental Railway Investigating Committee" in 1914, noone on the 4-person Commission appointed to oversee the NTR's contruction "had any experience or knowledge of railway building or operation" until 1911 when Major R.W. Leonard was added. 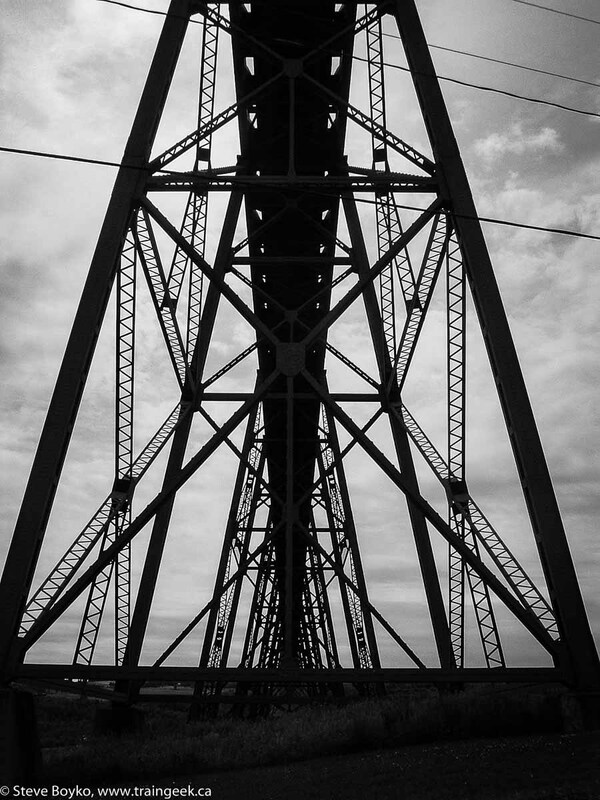 The NTR was built to very high standards, including a prohibition against grades greater than 0.4% in the east, and the use of steel bridges only. It was estimated that the total cost of the NTR would be $161,300,000 in 1914 dollars. Conservatively, that's about 3 billion dollars in 2006 (source). This is the second longest bridge of its type in Canada. The longest is in Lethbridge, Alberta. Here is the Salmon River trestle on Google Maps, in the middle of the map. 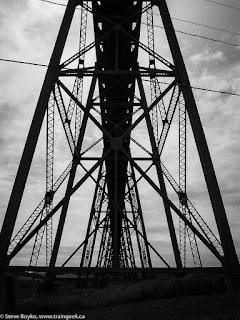 There are three other trestles in the neighbourhood, none of which are small. 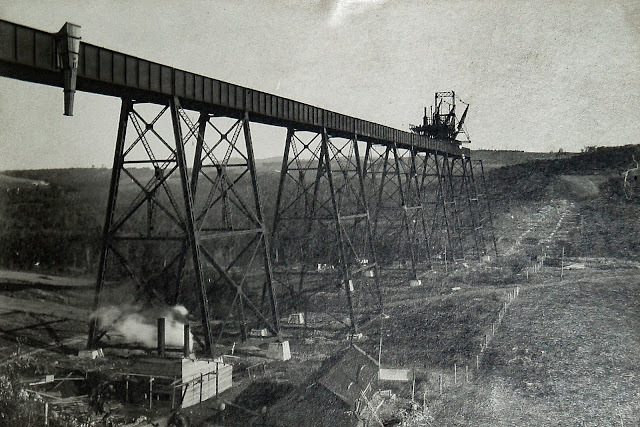 I am trying to find out when the Little River trestle was completed. It appears to have been done by the end of 1910. Shirley E. Woods' great book Cinders and Saltwater states that "by the end of 1910 the road was finished and most of the track had been laid. On November 24, 1911, the 231-mile stretch from Moncton to Edmundston was opened for traffic." 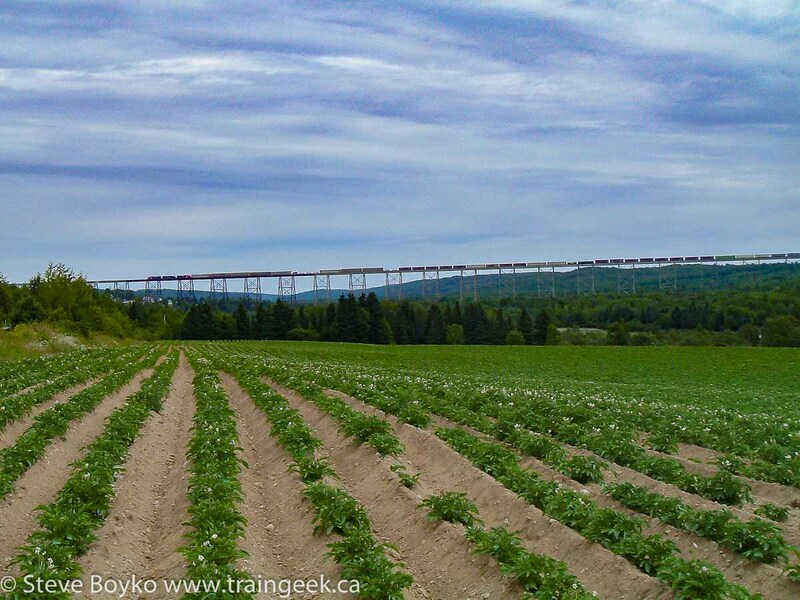 Today the Salmon River trestle and its little sisters are on the Napadogan Subdivision of CN's eastern mainline, and sees six mainline freights and one or two locals each day. The photo below shows CN 305 crossing in August 2007. "Al in Vancouver" put an excellent cab ride video on YouTube. He took a cab ride with his father in a CN freight around 1970, from Campbellton to Sayabec and back, and captured it on 8mm. The train had CN 3205 leading another engine and a mixed freight train, including what looks like some CN passenger cars. 3205 was a MLW C-424 built in 1966. It was leased to Mexico in 1978 and finally sold to Mexico in 1983. The video features the train going through Morrissey Rock just outside Campbellton, crossing the Matapedia River, and meeting the Scotian passenger train with an F unit on the point. Al told me it was the Scotian and I believe him, especially since the Ocean would have been running in darkness. There's no sound but the footage is just great. I can't say enough good things about this video! :) Thanks so much for posting that, Al. Kevin G was out chasing VIA this Sunday! Here's VIA 14 arriving and leaving Amherst, NS with 6405 and 6429 (Telus unit). He also caught VIA 15 arriving at Amherst with CBC unit 6403 and 6412. The shadows were starting to get long as VIA 15 pulled into Sackville, NB. And finally VIA 15 in the dark passing Gordon Yard. Dave took a very nice video of Thursday's NB Southern eastbound in the snow. NBSR 9801, 2317, and 9802 powered 35 cars (gypsum, wood chip, and boxcars mostly) through the snow to Saint John. The last of the three clips is especially good. You can read about the chase on Dave's blog. Gary Lee posted some videos of the New Brunswick Southern Railway working in the snow. First, a short one of the snowplow in McAdam. Next, NBSR 2318 in the blowing snow. NBSR 2317 and 2612 push a cut of cars back toward the McAdam station. OK, this one isn't NB Southern but it does have snow - VIA Rail's Hudson Bay train idles at the Winnipeg train station. As many of you no doubt know, NB Southern has been hauling gypsum to the Westroc wallboard plant in McAdam for a few years now. The gypsum comes from the Milford plant in Nova Scotia and is brought by CN to Saint John, then to McAdam by NBSR. Recently gypsum has been moving a different way. J.D. Irving is completing the Atlantic Wallboard plant in Saint John at the old shipyard on Courtenay Bay. The plant is a partnership with CGC Inc., a subsidiary of USG. CGC has provided some intellectual property to JDI, who will sell all the wallboard to USG for resale. CGC is also involved in another way. They have begun loading synthetic gypsum from NB Power's Belledune power plant into rail cars at the plant for delivery to Saint John. The New Brunswick East Coast Railway takes the cars from Belledune to Moncton, where CN brings them to Saint John. Finally, NBSR takes them to a siding behind Irving Paper where they are unloaded and the gypsum is stockpiled for Atlantic Wallboard. The plan is to have three sets of 12? train cars to run from Belledune to Saint John. So far they have two sets running. They are using the same kind of car that the McAdam run uses, as far as I know. Other gypsum operations in the Maritimes include the Milford-Dartmouth run for National Gypsum, and the Windsor & Hantsport's short gypsum run. There`s a new YouTuber posting videos from Halifax. HFXRailfan joined in November and has posted several videos. On Wednesday November 28, a time capsule was buried at the VIA Rail train station in Halifax. I understand it was to be buried under platform #3. The history of the Halifax train station was displayed in the station, then buried in the capsule. The plan is to open the capsule in 50 years... I hope I will be around to see that! I heard there will be a documentary about the restoration of the McAdam station on Rogers Television this Saturday, December 1 at 6:30 PM. BACKTRACK: Restoring the McAdam Train Station is a documentary that focuses on the heroic efforts of the villagers of McAdam to save the McAdam Train Station. The volunteers at McAdam have done a remarkable job restoring the station. They deserve congratulations for their work. The ground level is looking really good and much progress has been made. Speaking of McAdam, here's one of Gary Lee's videos showing NBSR 9801 pulling a string of cars past the McAdam station. Gary Lee and Dave Dineen both taped the same train, NBSR 9802 East, from McAdam to Saint John on November 21. Gary caught it leaving McAdam and Dave picked it up at Vespra (near Tracy) and chased it to Westfield before night fell. Here's Gary's clip showing NBSR 9802 and 2317 leaving McAdam. The rest of the story is told here, in Dave's excellent video. Here is his description of the chase. EDIT: Added link to Dave's commentary. Gary Lee has been busy! First he caught rare footage of a Guilford unit at St. Stephen. Here's Maine Central (MEC) 307 pulling a train into Maine. There's another one here but the quality is unfortunately not good. Here's a cab ride of NBSR 9801 going under a highway overpass near St. Stephen. Check out the freight from Saturday November 17, with 4 locos and 8 freight cars! Last but not least, here's a short clip of a video taken out the back of the Chaleur by clam502. I went through my train book library a little while ago, and identified some books that I will probably never read again. If you are interested in any of these books, please email me at steve@theboykos.com or call me at (506) 455-9792. I am asking $10 each for the hardcovers, $5 each for the paperbacks. Shipping NOT included. - Ghost Railways of Ontario (Volume 2) , Ron Brown, paperback, very good condition. Very well researched. - Lords of the Line , David Cruise and Alison Griffiths, hardcover, dust jacket torn. Never read it. - The Great Book of Trains , Brian Hollingsworth and Arthur Cook, hardcover, good condition. Never read it. - 100 Trains 100 Years , Fredric Winkowski and Frank D. Sullivan with Richard E. Mancini, hardcover, very good condition. Beautiful book. - Living Steam , Anthony Lambert, hardcover, very good condition. Nice book. - The Wonderful World of Steam Locomotives , P.B. Whitehouse, hardcover, fair condition. More European than North American. CN 148 (Chicago-Halifax) and 149 (Halifax-Chicago) have been renumbered to 122 and 123 (respectively) as of today. No word yet on whether they are renumbered all the way through, or just from Montreal east. CN 122 used to be a Montreal to Moncton train, a "modular" (as required) train, and 123 was Moncton to Toronto. The last time I have CN 122 recorded was April 3, 2004 at Windsor Junction, with CN 2522 and 2675. The last CN 123 I recorded was April 20, 2002 with GCFX 6068 and CN 5330 leading 53 cars. There may have been some that were more recent that I did not hear about. CN 148 at Milford, NS on October 26, 2002. CN 149 at McGivney, NB on February 19, 2004. Kevin G shared some photos he took in Saint John on November 12. 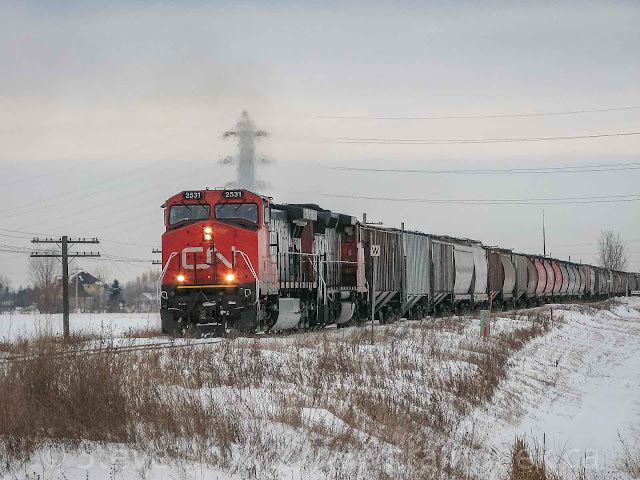 Here is NBSR 3701 and CN 7060 in the midst of the NBSR local train going out to the Irving Refinery / Irving Paper area. Another shot of NBSR 3701 working her heart out. This is a shot of the new crossing on Bayside Drive by the old shipyard, to serve the new wallboard plant. The crossing is not yet in service but should be commissioned any day now. Here is CN 5610 at the head of CN 405, at the south end of the Courtenay Bay causeway getting empty potash cars. This video shows VIA 15 at Milford from last Saturday. Nothing new to report on the Fredericton railway station. I haven't heard anything about the engineers' report, despite the email I sent to J.D. Irving back on November 13. Notice the open door in the freight shed, open since Halloween three weeks ago. When will this door be closed? Before or after someone goes in and gets hurt? UPDATE: I saw the door was closed this morning, November 22. Kevin G took VIA 14 to Halifax on November 17, and put the videos on YouTube. First, here's VIA 14 (the Ocean) arriving at Moncton with 6413 and 6426. This one shows them leaving Sackville, at Amherst, and meeting CN 407 at Oxford Junction (at 06:15 in the video). This one shows the arrival in the Halifax area, including Folly Mountain, Windsor Junction, Rockingham Yard and the Halifax Ocean Terminal. Finally, the last minute or so of his trip, including a walk up to the head end diesels 6413 and 6426. Looks like you had a good trip, Kevin! No sign of CN 120, so we went to the train show at the Dartmouth Sportsplex. I'll post photos of that later. Later, we decided to go to Milford to see the stainless VIA 15. On our way through Bedford, we passed under a very late CN 120 at 12:45. I'm guessing their presence delayed 15's departure! I set up at Milford and waited, while the sun peeked in and out of the clouds. A couple of other railfans showed up (hi David M and Steve D!) and we chatted while waiting for the train. Finally it rounded the bend at 13:33. That was it for the day! New YouTuber downeastrailfan put two videos up for our enjoyment. The first shows CN 306 rolling through Penobsquis, just outside Sussex. The second shows shiny CN 4728 shunting the Truro Industrial Park. 4728 was recently repainted and looks good as new. Finally, Jammin' Joel caught a CN local at Napadogan with CN 6021 pulling 20 cars. 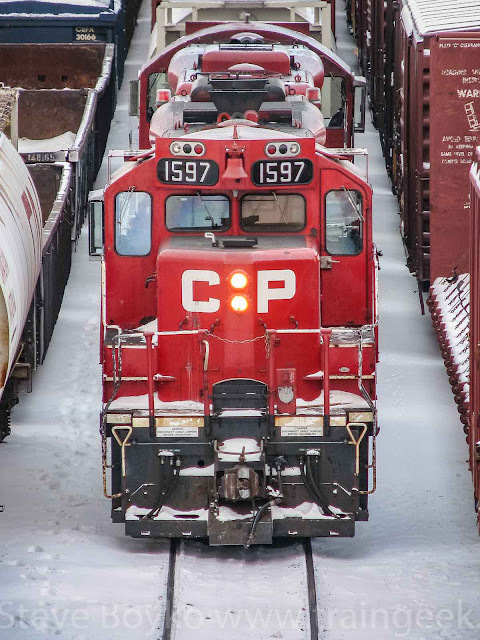 Jean-Pierre Veilleux reported that VIA 14 at Charny, Quebec had 6431 and 6428 leading 10 stainless steel cars. I know several people who will be quite happy to see the old cars back again! That means tomorrow's VIA 14 into Halifax will be stainless, and Sunday's VIA 15 will be stainless. I hope to see that VIA 15! A quick shout out to Mike's Train Blog, a new blog about... trains, by... Mike. He said a kind word about my site, so right back atcha! I didn't know about Take a Model Train to Work Day, this coming Friday, November 16. I will be on the road to Halifax that day, so maybe I'll bring one to work on Thursday. Most people at work are already aware of my train obsession, so this won't surprise them. Heck, one person who met with CN gave me the CN 2008 calendar they were given. It`s done with CN employee photos - very nice indeed. Just a quick note - I put the first few pages of the November 1, 1993 CN Employee Timetable for the Atlantic Region online. This is the last CN employee timetable that I own. Every year my wife goes to a conference in Halifax for her work, usually in November. This year it happens to line up with the Dartmouth Model Train Show on the weekend of November 17. I'll be there with my two youngest kids in tow, so if you see me, say hi! But first, I understand the report from Irving's engineers on the Fredericton railway station is not due until at least mid-November. I hope it has some good news and that J.D. Irving will get started right away on preserving the station for the winter. Here are two of my videos from Friday, November 2. The first video shows NBSR 2319 and 2610 shunting the east end of the Dever Road yard. This video shows the NB Southern eastbound freight arriving at the Dever Road yard in Saint John. Around 9:30 AM I saw CN 7000 shunting Island Yard. Here they are behind Crosby Molasses on Rothesay Avenue. NBSR 9803 and, I think, an SW1200 were at the east end of Island Yard. Just before noon, I saw shiny new SD70M-2 CN 8807 with CN 2625 at the wye near Island Yard. It appeared they had just finished turning on the wye, and they headed off to the Courtenay Bay potash terminal to get some empties. Over at the Dever Road yard, NBSR 2319 and 2610 were drilling the east end of the yard. Later, I saw NBSR 2318, 2612, and 9802 lead the eastbound into Saint John with 28 cars, about half of which were woodchip cars. This was at about 16:30. I hope to post that video later. Peter Swire sent this along to me on October 20.
area makes it a win-win opportunity." will cost substantially less with a possible $ 10 Million dollar savings."